SCRANTON—Recurring incidents of vandalism have occurred at Scranton Attendance Center, including multiple broken bars on the dome jungle gym, glass shards and small pieces of wire scattered in sanded play areas, graffiti written inside the tube slide, a burned hole in the top of the tube slide, pellets shot through two small windows, an overturned concrete bench on the Colt Walk of Fame, and paint and eggs splattered on exterior walls of the building. 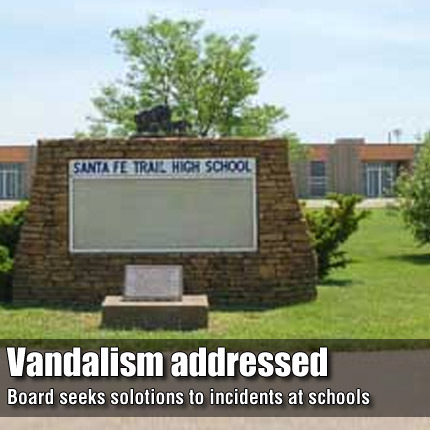 In a report to the Santa Fe Trail USD 434 Board of Education at the Oct. 12 meeting, SAC Principal Sheree Gill said although incidents had occurred within the past 12-18 months, frequency had recently increased. She said one section of the tube slide had to be replaced due to extensive, unacceptable graffiti inside it. “Last week a couple living close to the school complained about inappropriate behavior occurring during the late evening hours on school grounds,” Gill said. Gill requested that signs be posted and security cameras installed. She said signs would provide notice of closure of school grounds for public access from dusk until dawn, and cameras would likely serve as a deterrent, while also providing a record and possible identification of perpetrators. She said Scranton Police Chief Larry Alexander recommended signs that specified hours of closure. Gill’s report produced active discussion by board members and district administrators. Gill described a telephone call she received in the past week. She quoted the caller as saying, “Can you do anything with your playground? You have no idea what goes on.” She said that in a recent SAC staff meeting, Alexander said he had observed suspects running away from school grounds late at night, but if apprehended, they could only have been charged with curfew violation. Gill said Alexander advised that due to extended daylight hours during the summer, signage which specified dusk to dawn closure would eliminate several hours when law enforcement could apprehend and charge suspects for trespassing. USD 434 Board President Randy Boudeman questioned if the problem was district wide. Overbrook Attendance Center Principal Tammy Endecott noted the problem is not unique for Scranton, saying that approximately two weeks ago, eggs had been thrown at building walls. She said broken glass is routinely picked up daily on the playground. Carbondale Attendance Center Principal Michael Flax said things were not pleasant at CAC seven to eight months ago. He cited incidents of vulgar and racial graffiti, paint splashed on building doors and broken windows. He said that although exterior security cameras have been installed this summer, higher camera resolution would make it easier to identify vandals. USD 434 Superintendent Steve Pegram said currently two students are paying restitution for damage of district property, in addition to being suspended from participation in extracurricular activities. Board members agreed the threat to student safety and the cost to the district due to acts of vandalism is real and must be addressed. Gill’s requests were tabled for further investigation into preventing vandalism and apprehending perpetrators.